I have learned that showing up a couple days in advance for a stage race is a very good idea. I hit the road early on Saturday morning to begin my 4 hour drive to Aspen, Colorado to chase the USA Pro Challenge for a week. Excited as any other fan - and there are many of us here - on their way to view a good week of pro racing and cheer on our favorite riders. 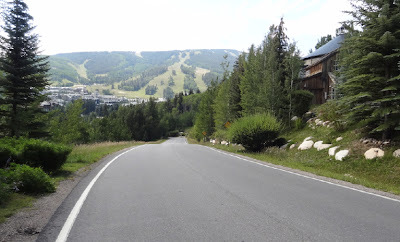 It has been 34 hours since I left Denver and already I have had a great bike ride up Beaver Creek including the road to Bachelor Gulch (think Stage 4); I saw Timmy Duggan and another Saxo Bank-Tinkoff rider testing the climb that morning and shouted out a loud hello. 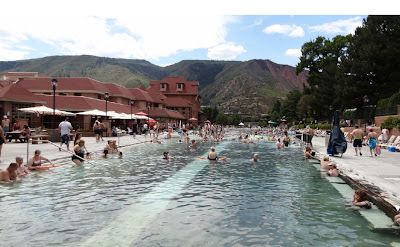 I stopped for a dip in Glenwood Hot Springs before arriving in Snowmass Village and picking up my media badge. I then visited the mechanics while touring the team parking area and enjoyed a fresh espresso courtesy of the Cannodale team bus. Thank you very much. I joined the line of fans hopping the gondola to the base village to view the official Opening Ceremony Team Presentation. This was the first team presentation I had ever been too, usually an expensive ticket separates me from any such ceremony, but this year it was free to any fan. Phil Liggett and Paul Sherwen hosted the ceremony which was just the right touch to start off the week of racing. I camped for the evening at Difficult Campground. A beautiful setting among aspen trees, where I fell asleep after a roaring camp fire. 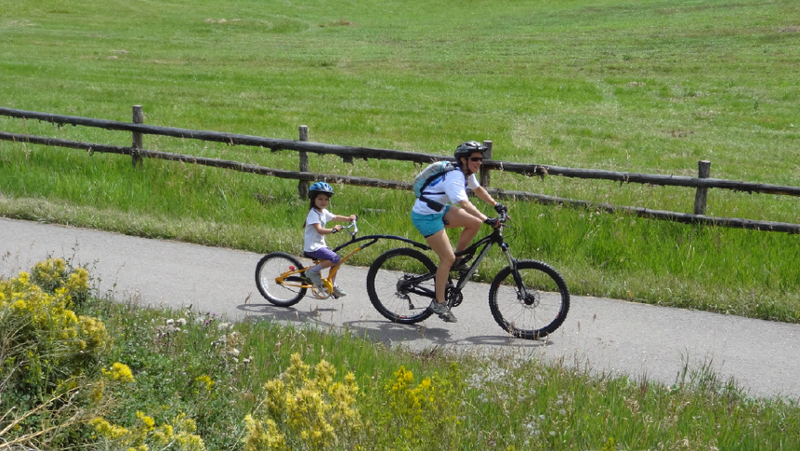 I awoke early to ride my bike up to Maroon Bells where I saw a cow moose with her baby, deer, and mormot. I also met Mary and Judy - two of the nicest Park Rangers you could ever come across and even received a treasured gift of a smokey the bear bandana from Judy. On the long smooth descent down I looked up to see Team Sky approaching and waved as I watched the team pass by on route to one of our most recognizable Colorado landmarks - the Maroon Bells. 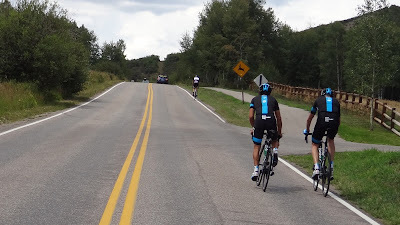 Oh and it's not over yet - next was the thrill of realizing the entire Saxo Bank-Tinkoff team had swarmed around our cars at the intersection to the road returning from Aspen to Snowmass Village. I left those riders only to come across the Argos-Shimano team, then suddenly I spotted Richie Porte and Chris Foome ahead. By this point I was in no hurry to pass these two notables, so I hung back watching, soaking it all in. Yup, that would be Richie and Chris riding their bikes in front of my car, this is pretty cool, think I'll just watch a spell. Finally I got the nerve to pass them, taking a wide berth not to be the one to knock those two off the road. 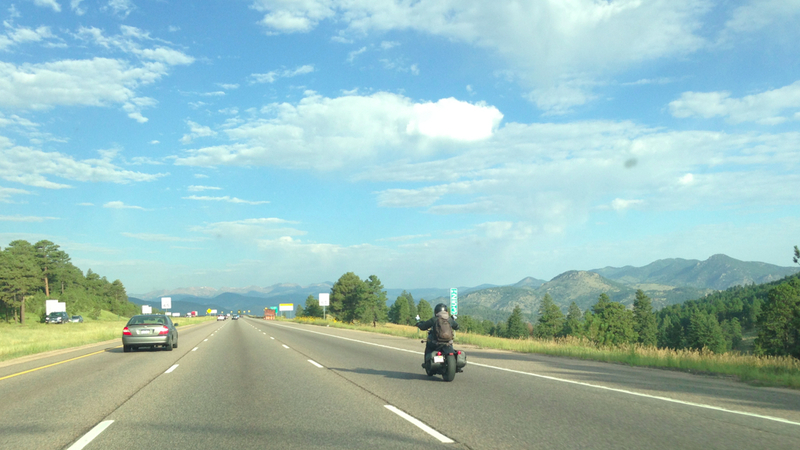 As I passed, they both looked over and smiled. I imagined how they had waved and smiled at every cycling fan and Aspen resident during their 3-day stay here to prepare for the race. Realizing this is just too good to miss, I pulled the car over at the next turnout and jumped out with my camera. I joined a pack of cyclists and fans gathered spontaneously at the small summit to watch the rider after rider pass by. We had fun naming the approaching riders and teams as they climbed toward us. Following that fun, I headed to the kick-off press conference which took place this afternoon at the Aspen Institute. Press conferences are a curious tradition, no revelations come out of them but it is a nice respectful way to start and finish a race and get to know the personalities of the riders a bit better. What I noticed today is that some smack talk and race psychology goes on at pre-race press conferences between riders. Very interesting to observe. After the press conference I drove to scout the route with Ryan Muncy, another photographer who is here at the race (I will be sharing some of his fantastic photos in an upcoming post). Tonight the race organizers had a reception for the media which was much appreciated. A way to meet those I had yet to meet and reacquaint with those I had. I think this social pre-meet will come in handy when we are all smashed together with overlapping lenses; hot, tired and sweaty at the finish line in weeks to come. The mood and atmospheres of these first days in Apsen/Snowmass have been wonderful. I wish you could all be here. Rider sightings and access is unprecedented. It seems to me that if the first year of the USA Pro Challenge was about securing sponsorship and safety, and the second year was about developing the host cities and team hospitality, then this third year has been about creating exceptional fan opportunities and recreating how to package a stage race for fans and riders. In my opinion the USA Pro Challenge is no longer trying to catch up to or copy the Tour de France, they are trying to create something unique here in Colorado. I can't wait to see what they have in store for us next year. On thing is for sure - this should be a fantastic race to attend as a fan. For more information about the race please see the Pedal Dancer Fan Guide Page at: USA PRO CHALLENGE. 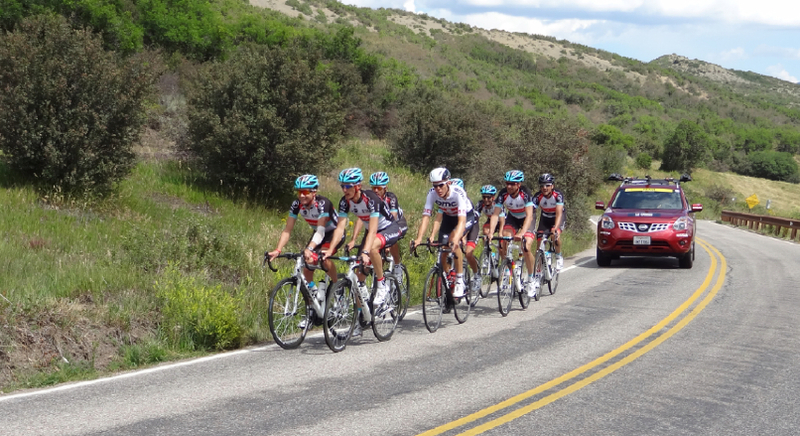 Lots of information for fans about Stage 1 may be found at: USA Pro Challenge in Aspen/Snowmass. Hitting the open road - I love road trips. Especially a road trip leading to a bike race. The first part of the steep climb to Bachelor Gulch near Beaver Creek. This additional climb at the end of Stage 4 instantly turned the stage from favoring an all-rounder to a climber. It will be tough. Glenwood Hot Springs. The price sure has gone up since the days we would hit the springs after rock climbing or hut trips, but still it was so relaxing, and crowded - it reminded me of 4th of July on Laguna Beach, California. The beautiful and highly recommended ride to the Maroon Bells in Aspen, Colorado. Yup, sure enough. You don't see this every day. And here comes the Argos Shimano team rolling by, so friendly to fans standing along the roads to cheer them on during their training rides. 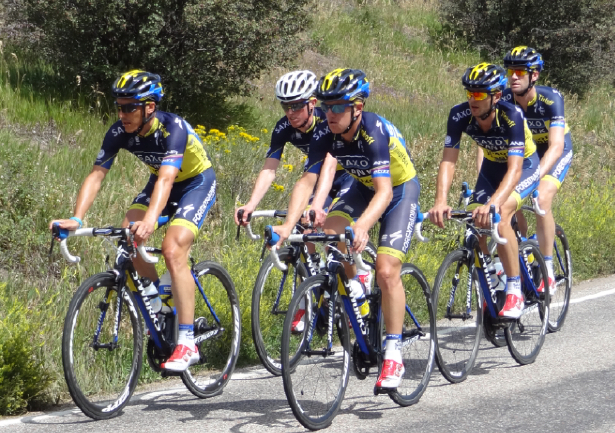 Saxo Bank approaching on some nice quiet roads near Snowmass Village. There were cyclists everywhere today who got to ride along with these riders. Team Saxo Bank-Tinkoff out on a training ride. And now RadioShack Leopard Trek rolls by - this is an awesome way to spend 15 minutes of action along the roadside, and all because I got to go to the race a day early. A nice bike path runs Parallel to Owl Creek Road, and will be easy access for fans to get up and down the hill (since all roads on course will be closed) for Stage 1 from Aspen to Snowmass Village. Casual rider interviews were going on as I arrived for the press conference located at the Aspen Institute this afternoon. 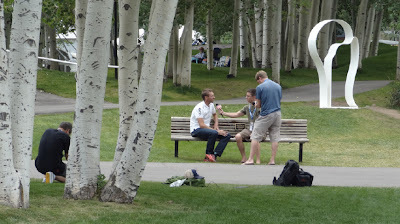 Her Joe Lindsey of Bicycling interivews Jens Voigt in the garden. Chris Froome looking pretty relaxed at the press conference (with Jens Voigt sharing his words of wisdom in the background. The line-up at the opening press conference. We got to hear from Rory Sutherland, Martijn Verschoor, Richie Porte, Chris Froome, Tejay van Garderen, Christian VandeVelde, Jens Voigt, Peter Sagan, Tom Danielson, Shawn Hunter, Jim Birrell. 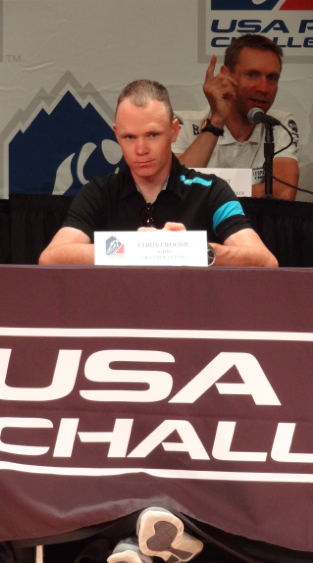 Chris Froome: "It's a pleasant atmosphere, apart from the altitude. It is an active outdoor lifestyle here in Colordo." No doubt he noted all those cyclists out on the roads riding today. Richie Porte: "It will be nice to struggle over Independence Pass at the back of the peloton." Peter Sagan: "After 3 days I understand it is very difficult racing here." Jens Voigt: After explaining that his direceur sportiff had come upside of him during his breakaway to Beaver Creek last year and commented, "Jens it is a long way." "But it all worked out in the end" Jens said. 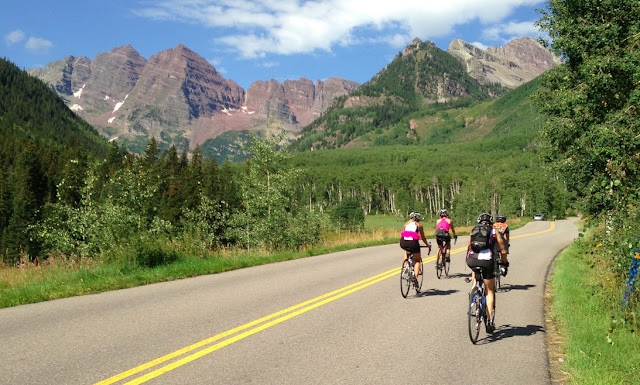 Tom Danielson: The stage from Gunnison to Aspen was one of the most amazing experiences I have ever had on a bike." Christian Vande Velde: When asked what he like most about this race - "Besides the Fans, epic climbs, and insanely successful event - just getting to race over these climbs in the United States with family and friends coming to see." 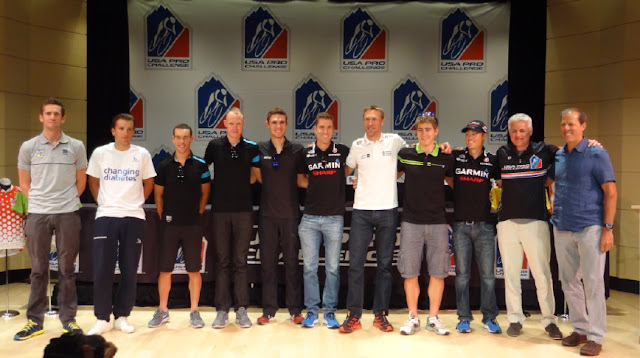 Tejay van Garderen: "We are taking this race seriously. We brought a really strong team. We'd like to win it. 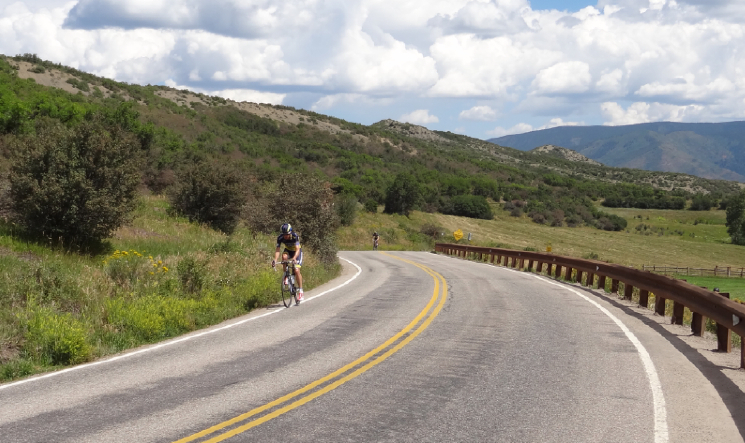 Tomorrow is the start of Stage 1 - for more information on the stage please read: USA Pro Challenge in Aspen/Snowmass. Or for more information on the race in general: USA PRO CHALLENGE.